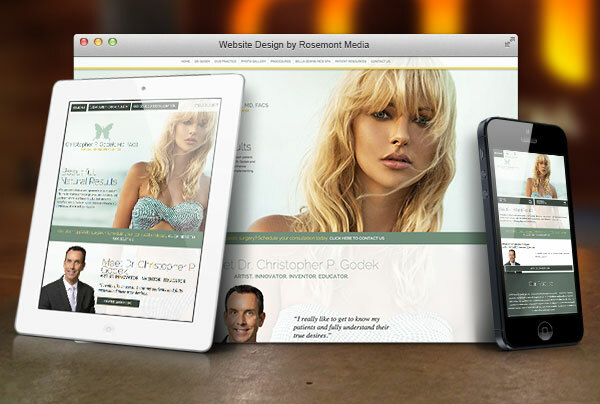 In collaboration with Rosemont Media, New Jersey plastic surgeon Christopher Godek, MD designed and developed a customized responsive website that reflects the quality of care and aesthetics conveyed throughout his cosmetic surgery practice, the Personal Enhancement Center. Complemented by unique imagery and state-of-the-art design elements, the new site hosts detailed practice and procedural information in a convenient, user-friendly layout that adjusts to fit the screen dimensions of any Internet-compatible device. When accessed from a desktop or laptop computer, the homepage of Dr. Godek’s site features a multi-screen parallax scrolling design that enables foreground and background images to move at different rates as the visitor scrolls up and down the page. Additionally, a special menu bar located on the right-hand side of the screen allows for seamless navigation to particular sections of the page. For those browsing on a tablet or smartphone with a smaller display, each page of the site will automatically reformat to provide a better viewing experience. In addition to an aesthetically-pleasing color scheme, the imagery for the website primarily includes “actual patient” photos used in lieu of stock model images. Every page was designed with Dr. Godek’s input and preference, including custom-themed pages like “Meet Dr. Godek”, “Why Choose Dr. Godek”, and “In the Media” – the latter of which hosts interactive awards and magazine features. Furthermore, his uniquely-crafted before-and-after photo gallery is equipped with a filtering capability that enables visitors to view results achieved by patients of similar age, height, and weight. Behind the scenes, the latest plastic surgery SEO strategies were implemented into Dr. Godek’s site to help the Personal Enhancement Center rank competitively in his geographical region for breast augmentation, rhinoplasty, and other popular key terms. To view the type of website our team at Rosemont Media can design, develop, and maintain for your practice, check out www.personalenhancementcenter.com.